There are several places on your laptop where a PC Card may be inserted. It might be a gaping hole on the side of the laptop, a tiny “garage door” that’s covering the hole, or a hole that’s hidden behind a panel. Note that some laptops sport a depot for two PC Cards, stacked one atop the other. Some laptops might have room for only one PC Card. When inserting a PC card for the first time, be sure to read the instructions beforehand. Some cards might require that the laptop be turned off before inserting the card. 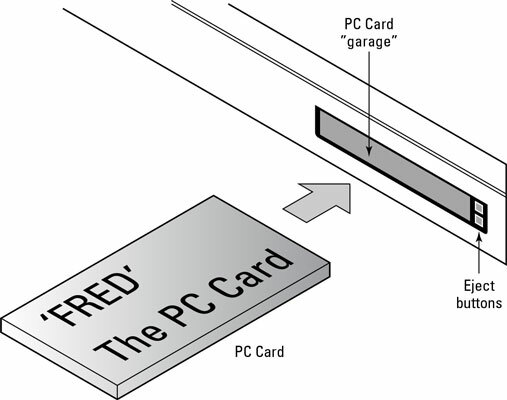 A PC Card is inserted into the slot “holy” end first. In fact, it fits in only one way. Push the card in all the way until it fully docks with the connectors deep down inside the laptop. If the hole is too small for the PC Card, then what you’ve found is most likely a memory card reader, a hole that accepts Compact Flash, Secure Digital (SD), and other memory cards often used in digital cameras. To remove the card, locate the eject button alongside the slot, right next to the door. (See the figure below.) Press the eject button all the way in, and the card pops out a little bit. You can then pinch the card between your thumb and forefinger and pull it out the rest of the way. An equal number of eject buttons appears alongside the spot where the card slides in. Note that an eject button pops out a ways from the laptop’s case. Remember to push it back into the case when you’re done with the PC Card. That way, the knob doesn’t snag on anything and possibly break off.